Beaufort Park is an award winning development by premier UK property developer St George in this new residential location in North West London. 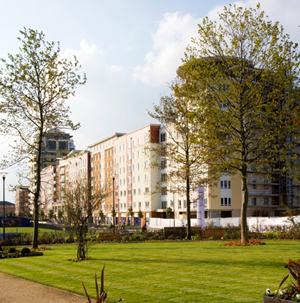 Hendon is a long established residential area of North London which is gaining popularity, thanks to the extensive urban regeneration of which the Beaufort Park development is an integral part. Hendon and its environs are full of great leisure and sporting opportunities, fast-improving shopping areas and a broad range of restaurants that reflects the area's rich cultural diversity. The RAF Museum adjacent to Beaufort Park, is one of several heritage centres within the Barnet borough boundaries. The Church Farmhouse Museum is Barnet's oldest building, dating from 1660, and is open to the public. The Copthall Sports Centre and neighbouring golf course are nearby, while playing fields at West Hendon border the popular water sports venues of the Brent and Welsh Harp reservoirs. The revamped Wembley Stadium is only a short drive away, while the grounds of Saracens RFC at Watford and Arsenal FC at Finsbury Park are all within easy reach. Beaufort Park's landscaped grounds combine space, parkland and tree-lined boulevards of cafes, shops and restaurants providing the ideal mix for modern living. The development also has an on-site gymnasium, a nursery, bank, Tesco supermarket and a car park. Situated approx 8 miles from the West End. Colindale Tube station on the Northern Line is within a five minute walk and Mill Hill British Rail station is also located nearby, both offering direct connections to the heart of London. Apartments at Beaufort Park are also well located for access to major roads and the UK motorway network. Several shopping centres and extensive open parkland at Scratch Woods and Hampstead Heath are all within easy reach.